Has anyone else noticed the quite unmistakable resemblance of the Gustav-Heinemann-Bridge to a row of plastic beer crates? Fifty-one such crates should be enough, side by side, to create a decent scale model. I can’t seem to get this image out of my head. It’s not just the same colour as a plastic beer crate, but also the way the entire steel construction bears semblance to injection-moulded plastic. 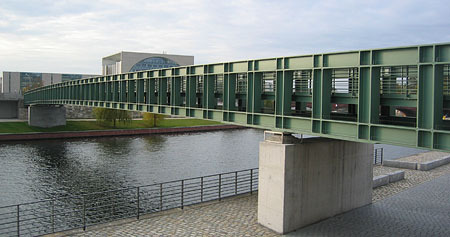 The bridge, which was inaugerated on the 30th May 2005 was built by Max Dudler, who has offices in Berlin, Frankfurt and Zürich. Somehow it’s the repeated-square motiv of this bridge which makes sense in the context of contemporary Berlin architecture, where so many buildings resemble boxes with punch-cut holes for windows. The square has become a horrible plague, and Dudler’s portfolio reads like a hommage to the shape, from which fellow architect Oswald Mathias Ungers has made an entire career. There will follow, no doubt, many more postings about this ‘cooky-cutter’ architectural style, already refered to elsewhere in these pages as ‘bland box’, or ‘Euro bland’.